Everyone's got a Cobra replica. but how about something with the same kind of power-to-weight ratio but skewed a bit more towards the luxury end of the scale? 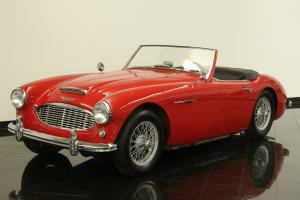 Take a good look at this gorgeous 1963 Austin Healey 3000 Mark III. which. like the Cobras. is filled with a performance American V8. upgraded suspension. 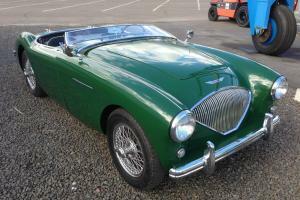 and that kind of old-world look that makes these Anglo-American hybrids so appealing. 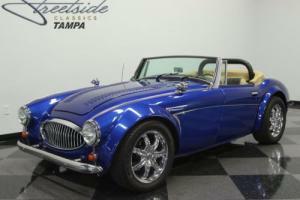 The Electric Blue metallic is the perfect shade for this car. It instantly announces that this craftsman-style body has a wild side. The brilliant gloss and shine not only emphasize the classic British elegance. but also it makes the most of the extra wide fender flares that come on the fiberglass body. 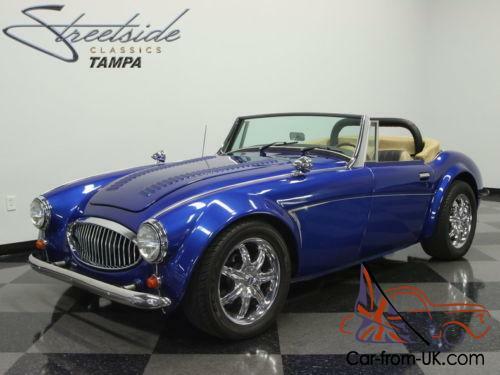 The execution on this car is a true transatlantic partnership that blends the brightwork of the original-inspired oval grille with big 16-alloy wheels. But the best way to see how the English and American styles blend together is on the custom pinstripe that starts behind the front fender and doesn't stop until it reaches the rear chrome bumper. This hot rod style flair celebrates the best of the USA. and at the same time. it highlights the silhouette of this old world icon. 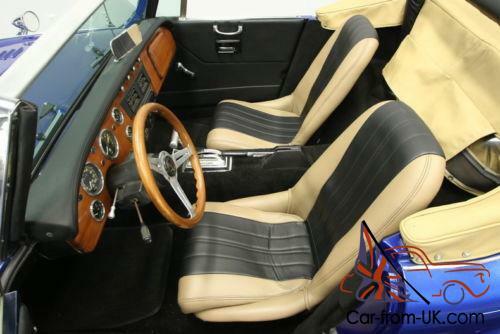 The handsome tan leather bucket seats with black inserts are a great piece to unite this interior. The tan coordinates nicely with the full folding top (and you even get roll up windows for true weather protection!) The black is the color of the carpeting. door panels. trunk. and safety roll bar. All of this feels fresh and new. so you know you're buying a premium build. The British and American styles come together nicely inside. too. You grab the Grant GT three-spoke steering wheel with your left hand. and your right one will love the B&M ratchet shifter. But while those are very muscle car-like. the real wood dash with full round gauge package is very European. Plus. you get amenities that are great no matter where you're from like the AM/FM/CD stereo and provisions for air conditioning. Under the hood is where the best upgrade is. Just like a Shelby Cobra. 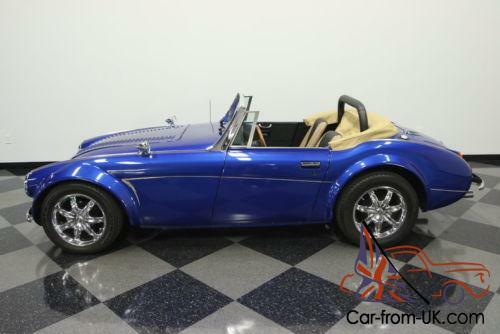 this Brit style gets a major power boost from an American V8. In this case. 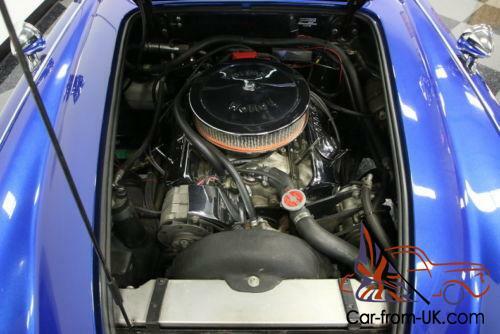 it's a Chevy 350 cubic-inch motor that looks awesome filling every inch of the engine bay. Plus it offers plenty of shine in places like the valve covers. air cleaners. and alternator shroud. 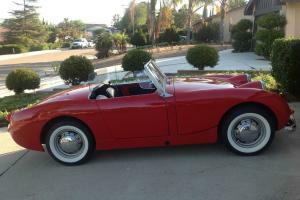 And really the motor needs to looks so good because people will be asking plenty of questions about this very unique roadster. But more than just looking great it has been upgraded with performance components like a Holley four-barrel carburetor and Holley Street Dominator intake. It's also backed up by reliable components like an aluminum radiator. electric fan. and there is less than 27K miles on the whole build. That's why this drop top not only makes a great sound out of the dual exhaust. but it also fires up eagerly. On the road the TH350 three-speed automatic transmission is perfect for cruising in the everyday situations. 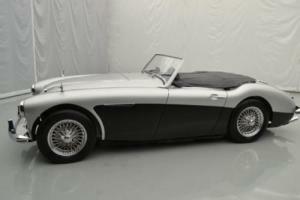 and it's also stout enough to handle the times when you want to use this lightweight roadster for all-out speed. Plus. the Mustang II style independent front suspension. front disc brakes. and modern Kumho tires offer the kind of control you wished you had in a '60s machine. This is a custom build that everyone loves because it's unique style applied to a motoring icon without ruining an original body. That's also why you can enjoy this V8 convertible on the road with confidence (and we have the maintenance records to back this up. too!) It's time to grab the best of all worlds in a complete roadster package. Call today!! !